You already know that lace up trend is everywhere! All fashionistas and celebrities try to wear clothes or shoes with lace up décor. And of course you should try it too. If you’re our constant reader, maybe you’ve read about lace up flats and lace up shirt outfits, so today it’s time for lace up skirts. No doubt that for the summer every girl should have several types of skirts depending on her wishes and favorite style. 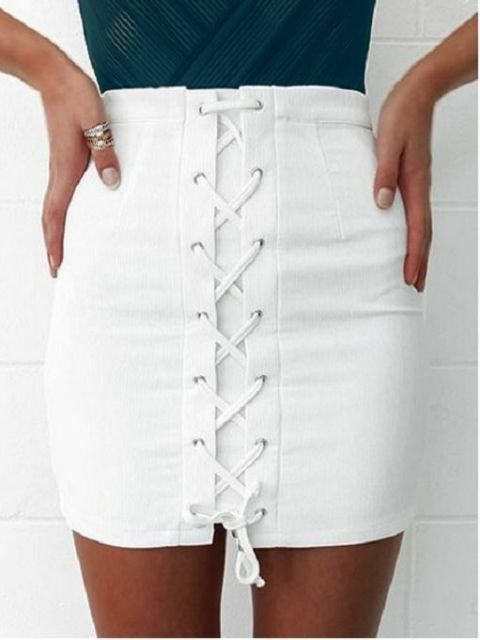 A lace up skirt will be a perfect choice! At first, you need to pick up a skirt according to your body shape. There are no special secrets and I think you already know what types of skirts match your figure. Then you should choose the length of the skirt (the most common and popular length of lace up skirts is mini) and fabric. 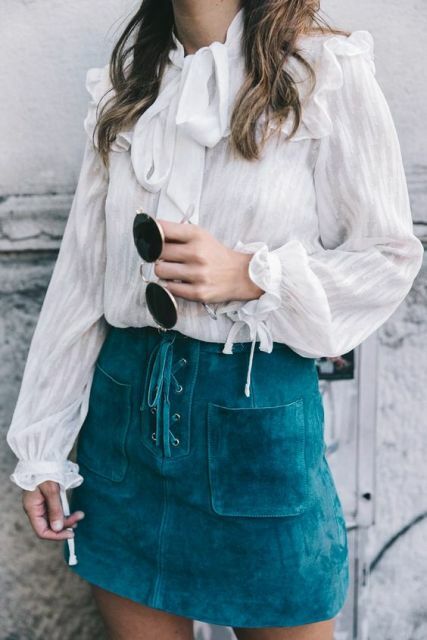 Despite the summer heat, many fashion bloggers and street stylers pick up suede and leather skirts cause they look so fantastic with lace up décor. For creating office looks, try to find a pencil skirt with almost imperceptible lace up décor on the sides and combine it with a classic button down shirt or a blouse. To make your office outfit trendier, pick up a high waisted lace up skirt and add classic pumps. 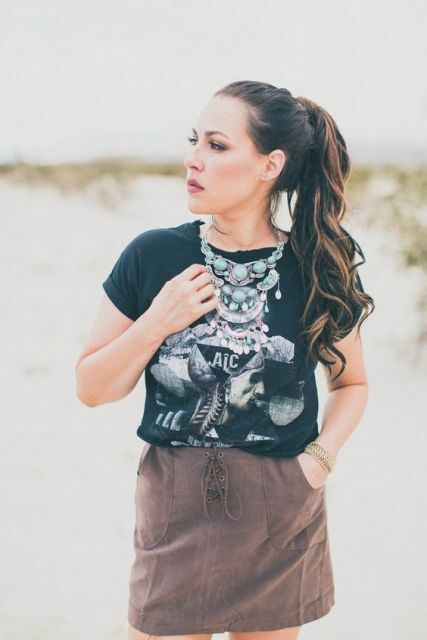 For casual looks you can choose a mini lace up skirt and pair it with a funny t-shirt tucked into skirt or loose blouse. If you wanna look more feminine, combine a high waisted midi skirt with a crop top or off shoulder blouse. Don’t be afraid to mix various colors of clothes, for example, you can combine a deep red blouse with a turquoise lace up skirt. 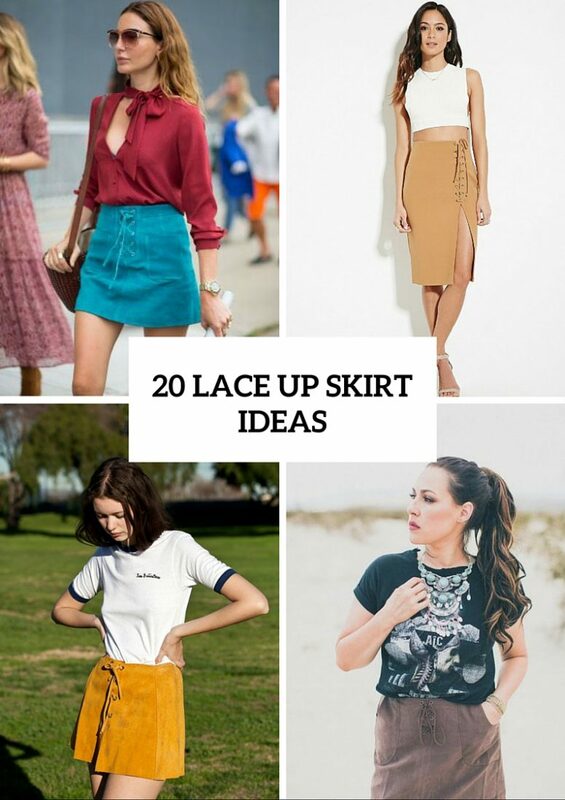 But don’t choose a lace up skirt with prints, cause you don’t need too many accents in your outfit. Look below for some inspiration. I’m sure you’ll find some cool ideas for your everyday life. Enjoy!